Donald Penn is an American professional football player who plays in the National Football League (NFL) for the Oakland Raiders as their offensive tackle. Donald Ward Penn has played for other teams like Minnesota Vikings and Tampa Bay Buccaneers. 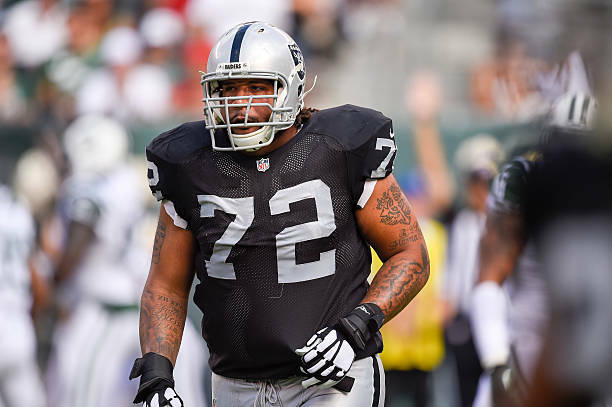 As an offensive tackle, Donald Ward Penn reportedly earns around $6 million as his yearly salary from Oakland Raiders. Further, Donald Ward Penn has an estimated net worth of over $24 million. Donald Ward Penn was born on April 27, 1983, in Los Angeles, California to parents, Donald Penn, and Nancy Penn. As per his nationality, he is American and belongs to Afro-American ethnic group. Further, his star sign is Taurus. He grew up along with his sibling, Crystal Penn. Donald Ward Penn attended Saint Bernard Catholic High School in Playa del Rey, California where he played for his high school football team. After completing high school, Donald Ward Penn enrolled at Utah State and played for the Utah State. Donald Penn was signed by Tampa Bay after he was released from the Minnesota Vikings in 2006. In April 2009, he signed a one-year $2.792 million contract with the Buccaneers. On July 30, 2010, he signed a six-year $43 million contract. Penn was named to the 2011 Pro Bowl as an alternate and replaced Green Bay Packers tackle Chad Clifton. On November 11, 2013, Penn scored his second career touchdown against the Miami Dolphins. He was released on March 13, 2014. Penn was signed by the Oakland Raiders on March 18, 2014, to a two-year, $9.6 million contract and as an eligible offensive lineman, Penn scored his third career touchdown. The Raiders re-signed Penn to a two-year, $14 million contract in March 2016. Penn was named to his second Pro Bowl in 2016. On September 15, 2017, Penn signed a two-year, $21 million contract extension with the Oakland Raiders. He was placed on injured reserve after undergoing foot surgery. He was named to his third Pro Bowl but couldn't participate due to the surgery. In 2018, the Raiders drafted Kolton Miller in the first round of the 2018 NFL Draft with the intention of being their future left tackle and at the end of training camp, Penn was moved to right tackle after Miller won the starting left tackle job. In October 2018, Penn was placed on injured reserve after a groin injury. Donald Penn is married to his wife, Dominique. The couple got married in June month of 2012. Together, they have two sons named Donald III and Dominick and a daughter named Demi. He also had an affair with Camilla Poindexter and has another daughter named Dylan with her. Donald Penn currently resides in his home located in Los Angeles, CA with his family. As much promising his career seems, his family life also seems to be happy and satisfying. As of 2018, Donald Ward Penn has an estimated net worth of over $24 million. He reportedly signed a two-year, $21 million contract with Oakland Raiders in 2017. Further, the NFL player has an average salary of $6 million annually. Donald Ward Penn so far has made earnings of $58,900,737 from his entire NBA career. Kept aside Donald Ward Penn financial earnings, his personal assets include a Home in Los Angeles, CA. Other than being a famous NBA offensive tackle, Donald Ward Penn is pretty famous in social media. He has 99.2k followers on Instagram. Donald Ward Penn is not only a world-class athlete but also has a very attractive individual. The famous NFL star is 6 feet 4 inches in height and weighs around 143 kg.